If you want to travel to Guatemala, 'the Land of Eternal Spring', and share yoga, life, and peace through building homes with indigenous people and teaching yoga in local schools and orphanages, this trip is for you! As a nonprofit, the project is funded through fundraising and personal finances. All are welcome! A wonderful opportunity to take your yoga OFF YOUR MAT and into the WORLD as you take a leap of faith, bonding with new friends and old, offering selfless service and receiving abundant love and joy! 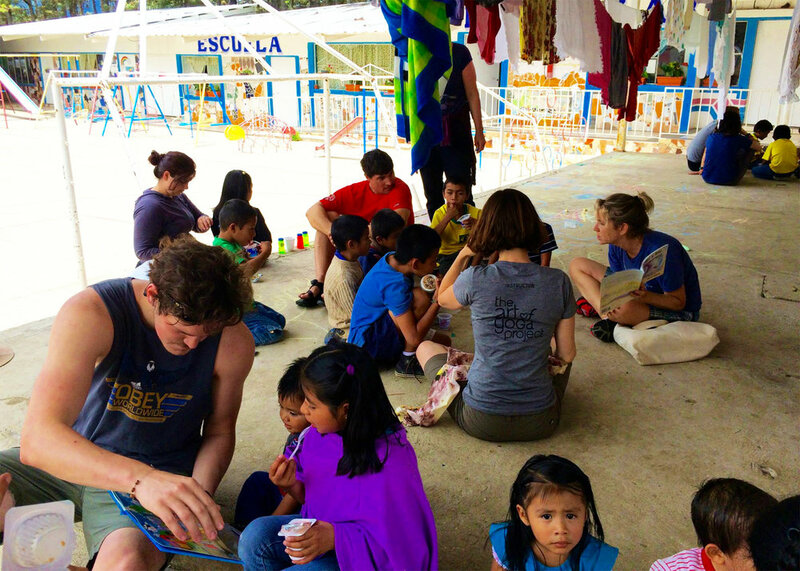 The primary purpose of our trip is to build a home for a poor, coffee-farming family and teach yoga to school teachers and children in a beautiful, small Mayan village in Guatemala. We will also spend one day at an HIV/AIDS orphanage in Guatemala City. Our days will be filled with hard work and great joy! Once we reach the village of San Juan, we will rise with the sun each morning in the "Land of Eternal Spring," overlooking Lake Atitlan, to practice yoga together. After a tasty breakfast, we will walk to our work-sites and build a 10x12 'block house' alongside the family who will live in this house. In the afternoon, you have the option to lead and teach yoga at the village school. At the end of the trip, we will spend a day in Santa Cruz, a little yoga village across the lake, eating fresh food, practicing yoga overlooking the lake and resting before heading to Antigua, the historic capitol city, for sightseeing and shopping. Consider traveling with your teenager, your partner, or your friends to deepen this life-changing experience. (Minimum age 15yrs). Shelley Pagitt will be facilitating the Yoga Sanctuary group. She and her husband have been traveling and working in Guatemala for 27 years, and are excited to return this year with our Yoga Sanctuary and Solomon's Porch Communities to share this wonderful opportunity to be a blessing in the world. We will meet together four times before embarking on this life-changing trip in order to gain insights into ourselves and learn about the culture as well as about fund-raising and trip details. We will also host a chili cook-off with the Solomon’s Porch community to raise funds for the homes we will build. We will also read and discuss the book The Four Agreements, a beautiful and practical book to help guide our personal and cooperative voice and actions as we work and play together. Come to one of the following meetings to learn more! We will have stories, photos, and answers to your questions. We will post the Informational Meeting times online. The total trip costs is $2600, includes 10 days of travel, housing and food, as well as building materials and local foreman’s salary in San Juan. If you wish to purchase your own airfare, trip costs will be reduced by $800. Participants are encouraged to include your family, friends, and co-workers in this service trip by asking for tax-deductible donations to cover the cost of the home and trip costs, which makes this a worthwhile endeavor for ALL! Yoga Sanctuary will provide guidance in fund-raising. We will also host a chili cook-off fundraiser for family and friends in March. Start thinking about this opportunity and let the possibility brew for the summer. A $300 commitment fee payable to Solomon's Porch holds your spot and is the down payment for your plane ticket. Shelley Pagitt is excited to lead this trip and return to San Juan where she has a 20-year relationship with many local friends. Please contact her with any questions. Regan, in San Pablo, Guatemala, sharing her passion for learning with the family who would live in the house she and her Yoga Sanctuary teammates built with the guidance of local masons. Was it hard? Did it change you? I’ve been asked these questions many times since I returned home. And I’ve asked them of myself. I’m not certain the answer is important, but the questions are. Should we fear what’s hard? Should we fear change? Or should we embrace them? Or maybe, these questions are a litmus test for doing something that’s worthwhile as opposed to frivolous, like a beach vacation. I can say for myself that I’ve been on a few frivolous vacations that were hard, because, well because, I was still there. Me, the person who gets in my own way, has the same phobias, weird quirks and old habits that go with me wherever I go and whatever I’m doing; I can find something to complain about even in paradise. But no, those trips didn’t change me or teach me anything. They were great, don’t get me wrong and I was relaxed eventually, but like most self-care, that well needs to be refilled constantly. If the trick to an enlightened life is to appreciate every act as sacred: pounding rock; laying brick; hand mixing cement; riding in the back of a truck; witnessing pain, suffering and death; then it doesn’t matter where I go or even if I go anywhere at all, because the holy in the ordinary happens every day. Thich Nhat Hanh wrote, “I clean this teapot with the kind of attention I would have were I giving the baby Buddha or Jesus a bath.” In cases of extreme poverty, wherever you find them, there are lots of baby Buddhas who need baths. If the work was harder than I thought it might be, then the rewards, which were immediate and plentiful, took me by surprise: resilient people; the mist over Lake Atitlan; glorious mango and guacamole; the atunchuck who mimicked every sound; the gift of a fast, cold shower; and new friends. The two towns on Lake Atitlan where we spent the majority of our time and where we worked are both charming and squalid, generous and insular, filled with smoke and roosters’ crows and garbage and above all, beauty. This dichotomy is a real-time lesson in Yin and Yang. Are the people who live there worthier of our time and attention than poor people here in our own city? No. But Yoga Sanctuary has a deep connection to this village in Guatemala, nurtured through years of consistent friendship and hard work, which changed the nature of my contribution. Everyone is welcome! Is this your year for a life-changing experience? Your tax deductible donation goes directly to building materials and local mason. We hope you will let your light shine with us this spring!! In Sumpango - sharing yoga, sharing life, and sharing peace with each other. Shelley Pagitt with her namesake, Shelli. Shelli's mama was in her last few weeks of pregnancy while Shelley was working on their house. Before they parted ways, Mama Candita told Shelley that she was going to name her baby Shelli. The two Shelley's share a deep bond and reunite every year. JOY! !